Tasia and Gertie have been blogging about UFOs (Unfinished Objects) so I thought I would too. AND this post includes a bonus knitting technique video tutorial by my mother-in-law - who used to be a knitting instructor! 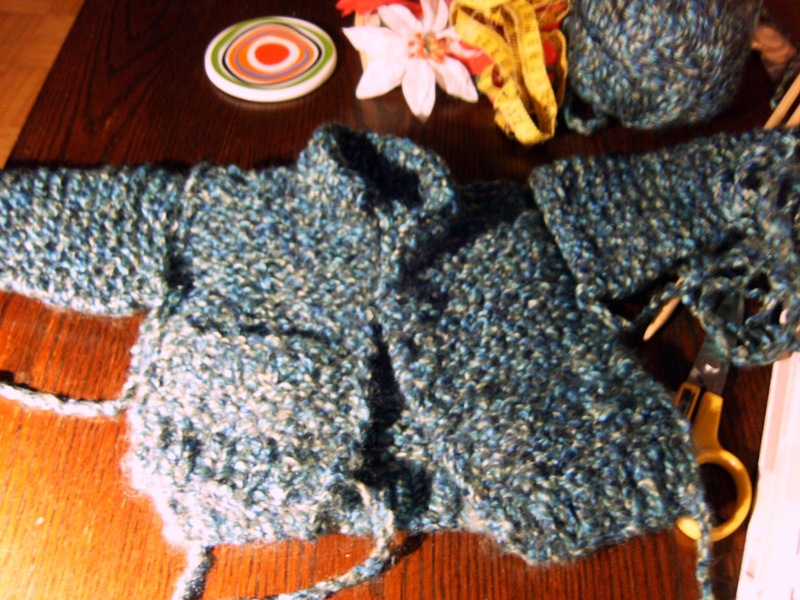 The technique is called the Three Needle Bind Off and it's useful for attaching pieces together, for eg. two shoulder pieces. It's hard to see the tiny pockets due to the variegated yarn but they are cute! A friend of mine had a baby in early November and I had been too busy to knit up anything more than a hat for the new little one. However, just after returning from my ten day trip to N ON and a week before I was going to meet the baby I decided to make him a sweater! Thankfully I had some deliciously soft chunky yarn waiting for just this sort of thing. Chunky yarn and 8mm needles = some speedy knitting! I settled on the Hayride Cardigan by Lion Brand Yarns and dedicated all my free minutes on the bus and at lunch times to knitting. I managed to make at least a piece a day and even made a pitstop for some lovely wooden buttons but I didn't factor in the finishing. So I didn't get to take it to her that weekend, but he'll fit into it for awhile to come! So that's one of my several many UFOs. I'm not great at finishing work, so I had my mother-in-law keep an eye on my progress. That's how I learnt that she knows a great technique for knitting together shoulder pieces - instead of seaming them! It's much neater and easier to boot. Here's a video of her demonstrating*. * On the row before knitting the seam, do not slip the first stitch (if that's what you normally choose to do) but knit it.